I have always felt like an ‘outcast.’ Different. Perhaps it was because I was a Korean adoptee or maybe it was because I have a disability. I was six months old when I was adopted from Seoul, South Korea. As infants we learn from people that look like us. I had some people who looked like me, but not many. The muscles in my body didn’t work as well as other kids. I remember being in preschool and not being able to keep up with the other kids on the playground. At the age of five, I was diagnosed with mitochondria myopathy, a genetic metabolic condition that is similar to muscular dystrophy. Doctors told me I would die in my teens. It had a profound impact on my life, thinking any moment this could be my time. My health condition challenged my overall health causing more implications including scoliosis, asthma, and a learning disability just to name a few. In December 2009, I graduated from college with a BA, in elementary education. My life changed in August 2010, just eight months after graduating. I was in a car accident and developed a neurological condition called dystonia. It is similar to Parkinson’s. I was bedridden for seven months and my car was totaled. I lost everything. My dreams of becoming a teacher and anything else that goes with the normal life of a recent grad. It challenged me greatly. What can I do? I lost all sense of hope for myself. My body was constantly in pain and I felt like I couldn’t do anything. Why did I work so hard to get to this degree? The condition caused me not to be able to drive for three years. It was horrible and often I think still is. There is not a cure for either of the conditions I have and I continue to live in chronic pain. Yet, I live in hope. I take the road less traveled. Often I want to walk the road that is ‘normal’ or what people would think of as ‘normal for a 20 something.’ When I was the lowest of low, I didn’t think I would be able to recover. How would I ever be able to move on? I thought my life was ruined because I was no longer able to work which is something I had worked towards. Gaining independence and freedom, while working gave me a sense of purpose. At my lowest point I had nothing. I was in bed watching the lives of people I knew and loved float by. I felt so alone, so lost. There were many people who helped me through it. Friends and mentors encouraged and supported me. I remember what really helped was belief in myself, my belief in God, and that there were opportunities out there. Life was and still is a challenge for me in countless ways. I think back to what helped me get through and continues to help me get through and realize it is holding on to faith, looking for opportunities, processing my learning, and encouraging my soul. H. O. P. E. It took me a while to say I made it and still I don’t like saying that because I don’t think I have made it. But I continue to trust, be grateful, and look at the positives in life. My pastor set me up with a mentor. Marianne encouraged me and walked with me throughout this difficult time. She really helped me to see the opportunities, see that there is a plan in this, trust in God and myself, and do things that encouraged me. She encouraged me and helped me through. I am grateful because in my times of struggle the number one lesson I learned is to be in the present and grateful for each day. When you have time on your hands, you can learn to appreciate life as it is. One day at a time. I am taking it one day at a time. I hope you do too. 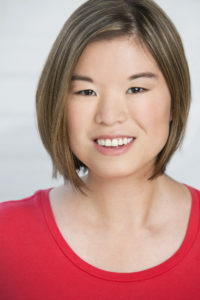 Nikki Abramson is a Korean adoptee who battles serious rare medical disabilities. She holds a MA in Education and BA in Elementary Education and early childhood. She is a teaching artist, educator improvist, speaker, author, mentor. 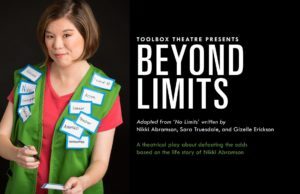 She wrote the book “I Choose Hope” and “Hope for Today” contributed to 5 anthologies, and co-wrote the show “No Limits” that turned into “Beyond Limits” based upon her life story. She always encourages people to stay hopeful and positive despite challenges. Check out her website.